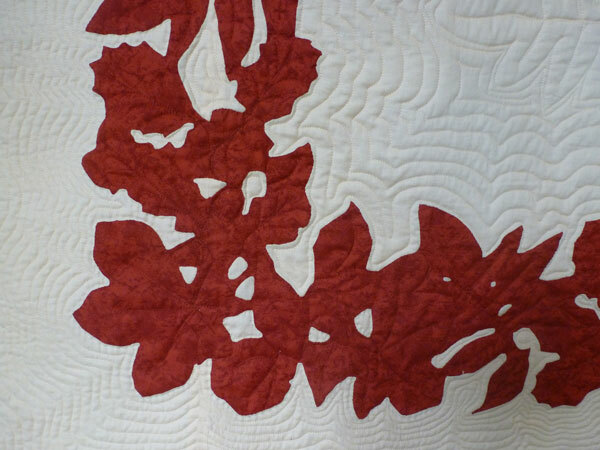 Paula introduces her Hawaiian quilt that was inspired by an autumn walk with Hawaiian quiltmaker, Betsy Okana. She describes learning about Hawaiian quiltmaking, meeting Betsy and making her quilt. 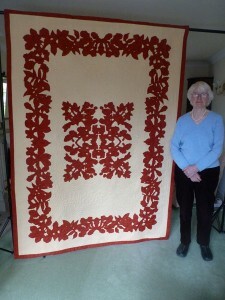 Paula has been quilting since the 1980’s and describes the difficulty in finding quilting resources and fabric at first, as well as the founding of Staffordshire Patchwork and Quilters. 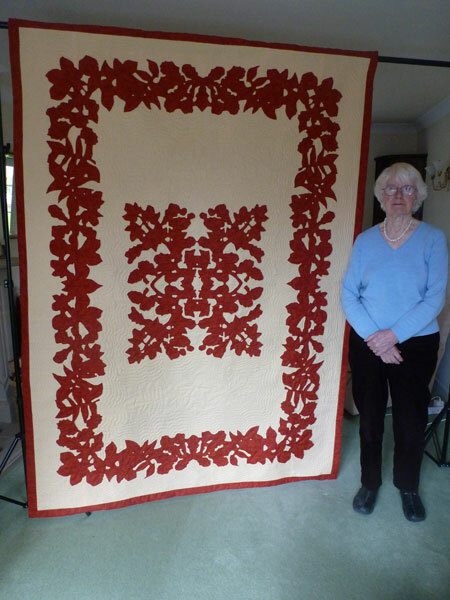 She had also been involved with The Quilters’ Guild since its early days and talks about founder members and the first AGM. Other topics discussed include Linus and charity quilts, quilting techniques from other countries (sashico and kantha), and quilt history. Victoria Martin [VM]: The ID number is TQ.2016.022. Interviewee is Paula Hulme. The interviewer is Victoria Martin. We are in Paula’s home which is in Stone in Staffordshire and the date is 3rd May 2016. Would you like to tell me a little bit about the quilt you’ve chosen? 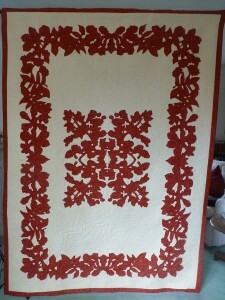 Paula Hulme [PH]: Well I’ve chosen a Hawaiian quilt which I’ve just finished after a long, long time. I started it in 1992 when I had a friend, a Hawaiian lady, quilter. Quite a well-known quilter called Betsy Okana staying with me and her husband was playing golf with my husband. And we were waiting for the men to come home. And we were sitting in a nice sunny autumn day in the garden and she suddenly said ‘I feel a quilt coming on me’ and I said ‘oh dear what does that mean?’ and she said ‘well let’s go for a walk in the lane’, in Butterton, where I lived at the time, er, which we did and we picked up the autumn leaves as we went. Um, up the lane, past the church, round the corner and then back again and when we got home we put these leaves down on a great big piece of brown paper and made a pattern with them. Um, which then you… you have to apply that to your fabric, um, and then you have to needle turn it, um, into place. All of which takes rather a long time and is quite a skilled job…job to get it set on its background absolutely perfectly. I did all that. It was cut out. When you’re making a Hawaiian quilt, you know, it’s like paper folding that we did in school when we made snowflakes. Do you remember? And sometimes when you cut it wrong the pieces all fall apart don’t they because you haven’t cut it properly on the seam. Well I managed not to do that so that I didn’t waste well several metres of fabric. Um, so it worked quite well. This of course is a sort of rusty red and the background is a lovely pale buttery yellow which I felt was the right colours for autumn. And Betsy helped me. And then she left didn’t she so I had to do all the tacking and placing of the…the two fabrics together. And then when I started needle turning I really got overwhelmed with the amount of work because it’s an intricate pattern going round. Holly leaves and oak leaves and, um, I think that’s an acer leaf there. Um, and all the little acorns and things. And it got put in a bag and there it stayed until last year when I celebrated my 80th birthday and I thought nobody else is going to finish that quilt when I’ve gone so its… it’s up to me. So in about July of last year I… every evening I sort of watched the television and hand sew at the same time and I found it actually very meditative if that’s the right word. Um, and since my husband died it’s one of the things I found quite useful in the evenings. I like to hand sew. Um, sort of half watching the television which is, um, comfortable. People… people around you really. Um, but in that time I’ve done a lot of sewing. VM: I make that at 24 years. PH: 23 years, well your maths is a lot better than mine. So I did take it down to the local group, The Staffordshire Patchworkers and Quilters in Stone and showed it to them and Cath Sheering who’s been a great help to me on many other, um, events that we’ve done together particularly trying to raise money for the Quilters’ Guild which we did I think four years ago now. I was at an AGM and one of the trustees stood up with a ten pound note in her hand and she said is anybody here willing to take ten pounds and turn it into £100 to make money for the Guild because we were desperately in need of money at that particular time, as we still are, and I took the ten pounds and actually Cath and I raised nearly £2000 which we sent to the Guild, um, as a result of this and presumably they made… other people did the same. Um, we had a stall on Eccles hall market and that’s where I’ve sold quite a few of my bits and pieces. Cushions and quilts and things which… which was good. I’m pleased to make it for the Quilters’ Guild. I’m a life member and I just think it’s a wonderful organisation so … um, and I enjoy going to the AGM and meeting people that you see from one year to the next. And I’m also a member of the British Quilt Study Group, um, and was at the very first meeting in the Whitworth art gallery. That’s about 12 or 13 years ago now. And we meet once a year. and, um, have lectures on techniques like, um, red, um, you know, the dyes that are used for this particular red, um, quilts that they had in the past and other, um, designs. One or two people are so knowledgeable on how designs are made and… and the… the history of them as well. Philip Sykas… I’m never quite sure of his name from Manchester. He’s… he’s just wonderful with his knowledge which he passes on. And then, um, people write papers on different techniques. Last time it was the [Sianna] type technique which I’d hoped to explore at the AGM in Llandudno which has just gone past but unfortunately the lady was ill so I haven’t managed to do that. Another time perhaps. I’m always interested in different techniques even if I don’t follow them through. It’s just nice to know isn’t it or nice to know how it’s done even if it doesn’t really…it’s not the thin you actually want to sew in the end. Um, so the British Quilt Study Group for me is …is always a fascination. It’s the history really. History of the textiles as well as the techniques and the designs as well which is good. Um, that was in Manchester this last year which was good. So I… I was… I had my arm twisted and I had to …to, er, well I didn’t have to, but I did do a paper which started out as the history of bed rugs. Unfortunately bed rugs there just aren’t any left. A couple in Cardiff in the St Fagin’s Museum in Cardiff. Um, but those are later. About 1700s. It developed from going to a course on family history at Keele University where we were discuss…discussing women’s will from 1550 to 1650 with Sandra Burgess and I attended this course for about three years and with a group of about eight or nine of us we transcribed these women’s wills which is not easy. It’s horrendous the writing. It’s awful. Um, but we did and then Sandra and her husband went to live in France so the project has really just fizzled out which is unfortunate so when I had my arm twisted I thought well maybe these women’s wills will make a paper together with the bed rugs which I sort of put the two together really. I have to say the women’s wills are fascinating. What, you know, you don’t think of women in 1550 leaving stuff which they did. Um, quite feisty women I think they were. These were all [phone ringing] all women in North Staffordshire and South Cheshire. Let me just go and… [Interview paused] [VM: yes] North Staffordshire and South Cheshire so I… we accessed them from Lichfield and also from Chester. Um, but these… these women were… were quite feisty women. Um, and… [phone ringing] [interview paused]. VM: Okay, so going back to your Hawaiian quilt, would you explain for me, and for those of us who may not know anything about how you make this Hawaiian quilt would you talk me through how you took your… your paper leaves and pattern and turned that into something on fabric. PH: Right, well to start with we collected the leaves and we put down a huge… the biggest piece of brown paper that we could think of and we placed the leaves, um, on that and just shuffled them about to make a pattern but we only make a quarter of what we’re doing from the centre of the quilt down on the long side and the centre of the quilt down the short side. So you’re only making a quarter of it because when you get your fabric you fold it like we did making snowflakes as little children…you fold it once and you fold it again like that, [paper rustling] which is difficult for you, and then you fold it again. So you’re making just a quarter of your pattern. And then you place your… your paper pattern onto the fabric which you folded in the same way and you cut with your scissors round it. Hopefully you remember not to cut the… the spine of your quarters really otherwise of course it would all fall apart when you… as you did when you were a child. Then you open… well you have to… [pause] I’m just trying to think how you… when you done that you… when you’ve actually folded your fabric and you’ve got your paper pattern you have to tack it so that it doesn’t move when you’re cutting it ’cause you’ve got a very thick layer of fabric haven’t you and when you’re cutting the fabric sort of moves doesn’t it so you have to tack it really quite tightly to make sure when you cut it out that it doesn’t move. Undo the tacks and then you start to open your fabric, but you have to open your fabric very, very carefully so you place it on a quarter of your background and then open it out very carefully like the leaves of a book I suppose and tack it into place so that, again, it doesn’t move. So there’s a lot of tacking and preparation done before you actually start the applique. And the applique is then done with needle turning which it does take practise. The points particularly and the inside curves which you with your needle you have to… hopefully the curve is on a bias. It isn’t always on a bias but if it is on a bias with your needle you can sort of push the fabric underneath and move your hand at the same time so that you’re turning just the tiniest, tiniest little bit of fabric underneath so that it’s, um, not raw edge. Um, and well with this I have to say it nearly drove me mad because there were so many ins and outs and I had cut out, um, little bits in between the leaves as well which at one stage I’d wondered whether to insert another fabric like they do on Easter Island and those other islands in the Pacific. Easter Island and I don’t think it’s Tonga. Anyway there’s another technique where you insert another colour fabric behind which I thought might be quite an idea. I went off that… went off that. That was too complicated altogether. And so I’ve just left spaces so it’s just the two colours; the applique and the background. Nearly all Hawaiian quilting seems to be just two colours. And um, the Hawaiians, I mean, they… they say in times gone past that the families who make Hawaiian quilts they will bury granddad or grandma in their quilt because it was so much part of their history and if you start to look at the history of…of Hawaiian quilts you will find… and you could start to read the patterns that this man was a fisherman. Because there perhaps might be net or… or maybe a fish but something even more subtle or a carpenter or a… um, an ironworker where there might be an anvil in it. And when you look at old Hawaiian quilts the history is there actually for you to see but you need to be able to interpret it but you can see which families they come from. And the… the royalty of Hawaii they often have crowns and… and well lots of other symbols really that you would recognise them. VM: Where did you… where did you get the fabrics from? PH: Um, let’s find the… I got them from… when I started it, you know, there weren’t very many, um, quilt shops. So I’m not sure that I know the name but it was, um, er, is that the one with the fabrics in it? Where’s the polythene… here we are… I don’t know if I’ve got the actual address [paper rustling]. I had ten yards of Indian maze which is the buttery colour by Ebor Springs Industry Natural Charm but that’s not the people that I got them from. And then I did think to put this steel blue and this deep lime and possibly olive in. And then the top is called bitter peach. Which is the rainbow collection [paper rustling]. Um and it’s slightly, um, mottled isn’t it? Yes I have… oh wait a minute I must have written to somebody. Susannah Secret I wrote to at some stage. Whether I actually got it all from them originally I’m not quite sure. But there weren’t very much patchwork shops then. Of course there’s hundreds of them aren’t there? Plenty of…plenty of choice. VM: But you’ve actually written on there, how much all the fabric cost you as well in 1992. PH: I suppose I have, have I? Well that did yes. The natural [unsure of word] but I was going to make two of these you know. I must be joking. I was seriously. So I’ve used up all the other fabric. I had enough for two originally. Um, so I mean that would cost now… I mean, if you think it was £50 then it would be possibly 150 to £200 now wouldn’t it I suppose in fabric alone. Um, so one yard was five pounds. Two metres. That’s was 11 wasn’t it? And that was I suppose another five pounds. Yeah. VM: Wow it would be pricey to make it now wouldn’t it? VM: Tell me about these pockets you’ve got in it a bit more ’cause I’ve seen them but obviously people watching this and listening to this aren’t going to be able to see them. Tell me what these pockets are. PH: Well I signed it. You must sign your quilts so when you do your quilts, perhaps not for Linus but, um, you must sign any other quilts that you make so it is signed somewhere on one of the corners. And then I thought because it’s such a personal quilt to me and personal to where I lived in Butterton, um, I would do a little bit more. So there’s my signature with the date. February 2016 and then again. I don’t know what’s going to happen to it when I go. Are my children going to want it? Two of my grandchildren… I have two granddaughters. They are interested in textiles. Whether they’ll be interested in this or not I don’t know. I thought I needed to tell the story because once I’d gone nobody knows that Betsy Okana really was the instigator of the design. And I must credit her because she… she was the one who started me off. Um, and she is a very special quilter. She really is. She does beautiful, beautiful work. Um, and she… she’s the same age as me, you know. We pop off all this history’s gone unless you know how to interpret it so I thought I’d do a little pocket and put in the story of the quilt, which I have, and hidden it along the, um, the, um, seam there. The border…the border. 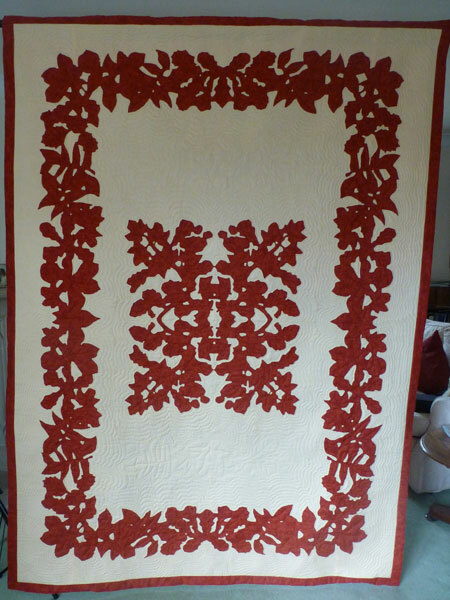 The border is wider than it really was meant to be because Ann Jermey did all the quilting and she left it raw. I had to finish it off and when I was very, very carefully unpicking a little bit where she’d gone a little bit too far I nicked the fabric didn’t I? Problem. So it was always going to be there. I couldn’t mend it so I decided that I’ve got enough fabric to do quite a wide border otherwise I think mostly the Hawaiian quilts don’t have such a wide border. Anyway, it’s left me a nice wide border so that I can make a pocket and in it I’ve done a little scroll and in the scroll which I’ve managed to learn how to print on my computer, which I typed out, and then I printed it onto this, you know, you can buy it at W H Smith can’t you for tee shirts and things, um, and put in the story of how I did it and in the other pocket on the other side are samples of the fabrics themselves. Again, just in case it ends up in a museum at some stage. All the information is there without undoing it or trying to unpick it. Because I’ve donated a quilt, um, which my husband gave to me called Tumbling Blocks which is all taffeta and silk and it had a very interesting special fringe and I took it to the first, um, meeting of the British Quilt Study Group in the Whitworth Art Gallery in Manchester and they were very interested in the fringe, which in itself is another historical project isn’t it, um, and then when my husband died and I knew that this quilt had got to be, um, what’s the word I want… needs to be conserved really. Not mended as such. And I hadn’t got the skills to do it. So at another meeting of the British Quilt Study Group I asked them if…if it was a suitable item for their collection in the Quilters’ Guild and they said well yes they would like to accept it. A, because of its fringe and also because it’s got a lot of yellow in it particularly bright yellow and it’s a lovely quilt and it’s got the papers in still. So I was able to furk around and find a date, I can’t remember the date. You know, it’s in my papers upstairs but its 1800 and something which is nice. So that has been on display in York. Um, February last year and that was lovely and they displayed it beautifully which I was thrilled to bit about so the family were able to go up and see it. And I’m thrilled that they’ve accepted in memory of my husband so what more do I want. VM: So tell me a little bit about how you met Betsy then who led to this quilt. PH: Well I was coming back… my eldest son had emigrated to Australia and my husband and I went to see him in I think it was 1987, um, and I had had to give in my notice. I couldn’t get leave of absence so my husband had to come home after our visit to Australia and I decided to stay on, which I did for a couple of weeks, and then decided to come back via, um, Vancouver but there was a stopover at Hawaii on the way and I had got interested in Hawaiian quilting. I don’t know where the interest came from. Just another technique I suppose which I wanted to explore and I had a catalogue for an exhibition and in the back of the catalogue had the names of the people who had helped with this exhibition. So I literally stuck a pin in it and it landed on somebody called Betsy Okana. So I wrote to Betsy Okana and said I’m coming to Hawaii on whatever the date was and I shall be here for a week. Is there any hope that we could meet and you could explain about Hawaiian quilting and she wrote back and said, ‘yes please, as soon as you come to Hawaii give me a ring and we’ll meet’. So that’s what I did. I rang her up and she said ‘come over. The bus number 92. Get off at Kaneohe and I’ll meet you’, which she did. And I spent the rest of the afternoon chatting with her and she was just wonderful and so the friendship developed. But in the rest of the week I actually went to one of the shopping centres in… on… I’m in Honolulu on Oahu ’cause there are lots of Hawaiian Islands and I was on Oahu. Um, and at the top of the shopping centre, it’s all open to the sky, and there was a lovely Hawaiian lady teaching Hawaiian quilting. So I sat with her I think two or three mornings a week learning how to needle turn and she taught me how to needle turn internal points and… and the external points. So by the time I left, a, I knew how to quilt… Hawaiian quilting and, b, I’d made a friend in Betsy which was wonderful. And her husband was keen on golf so a couple of years later, um, she came over to give some lectures actually here in… in England and she stayed with me when she was in the North Staffordshire area and our husbands played golf together and… and so the friendship developed really, which is lovely. So I still keep in touch. But, um, I don’t… well they have actually come over to Europe I think this year but I haven’t seen her since. She now lives in the States actually not in… not in… on Hawaii. Her husband is a Hawaiian. She’s a… an American. Oh and I met her at Paducah. The time I went to Paducah with, um, what’s the name of the person I went to Paducah with who ran the… Diane Huck. Diane Huck took a group to Paducah and my husband and I went and as I walked into Paducah there was Betsy so we had big hugs. And it was lovely. She was giving a lecture, um, and workshop I think in Paducah to …so that’s the last time I’ve seen her. That’s 2000. Is it 2000? I think it was 2000. Yes, I haven’t seen her for 16 years. Mm perhaps it’s time I went to America to see her. Maybe. VM: Come back with more quilt ideas. PH: Oh yes… yes absolutely. PH: No. No. I can… I do now because I can’t quilt by hand and if the fabric is very thick like the Linus quilts ’cause I make a lot of quilts for Linus. If I’ve put a fairly thick wadding in, not that I put a… but even a …but even a thin wadding I find quite difficult now with arthritis to get through it so I have got a walking foot on my machine. Um, the Bernina machine. Wonderful machine. Um, oh and it’s ancient and it only does six stitches but it’s wonderful. It goes backwards and forwards. And does everything that I want. None of this, um, computer business where you have to work it all out beforehand. Um, so with my walking foot I do quilt for the Linus quilts. It’s tougher as well and they’re going to get hard work aren’t they the Linus quilts I think. They’ll be washed quite a lot, um, so no I don’t really. I do machine, um, I’ve got some squares on the go at the moment and those will be put together by machine rather than hand, um, and then I apply things. Usually circles or elephants or dogs or something for the… for the Linus quilts. Um, on the top. And that’s the hand sewing that I’m doing at night when I’m sort of watching the television. And so anything else? VM: Long arm machining. So you had this long arm machined. How…how …how do you feel about that? PH: Well I think… well I still like the hand… hand quilting but for people… famous people who do wonderful, wonderful, um, designs they can’t possibly… they’re designers really and they want to get their work out there so I think that for them they need to machine quilt otherwise they wouldn’t… the ideas that are flowing in their mind they would never get done if they didn’t do it. Um, and for some of the, um, just trying to think of the person particularly that I’m thinking of who does wonderful quilts, she needs to machine quilt them actually. It holds the… the quilts together better I think. Um, and they’re textiles for… like paintings. They’re more art pieces and I think yes they have… they have to machine quilt I think. Mm. But I would rather hand… but I mean like, um, Barbara Chainey, is a superb hand quilter and to see her work is just like Amy Emms. It’s beautiful. Tiny, tiny little stitches that she does. Um, absolutely exquisite the quilting. I can’t do that anymore I’m afraid. VM: So let’s go back right to the beginning how did you first get interested in quilting? PH: It’s very difficult. I know that as a child I was interested in bits of fabric. And I made myself a bag, one of those sort of circular bags with a circle on the bottom and a drawstring at the top. There’s a name for them isn’t there? I don’t know what they are. I made it out of some blue doubled sided velvet and you never see double sided velvet now but it was velvet on both sides and they were curtains from my grandma’s house. And I made this blue bag with its drawstring. How I managed to do it I don’t know ’cause it was thick but I obviously managed as a probably nine ten year old. And I filled it with bits of fabric and my mother threw it away, which is probably why I remember it because it was horrendous for me at the time. You’ve thrown away my… ’cause she wasn’t interested in sewing at all. But I must have been… it must have been there mustn’t it? So had to do a bit of sewing at school and when I left I don’t remember doing it in my early teens but probably when I got married I started putting bits of fabric together then. And that’s when I made the first, um, cushion cover was a hexagon and the second cushion cover which I’ve still got is an octagon and square. Um, and it just went on from there. Um, so I was self-taught but then I went to an exhibition in Seven Dials, in Covent Garden, and I met somebody there who said ‘wouldn’t you like to be a member of The Quilters’ Guild?’ and I said ‘oh well I’ll think about it’ because I feel if you’re going to be a member of something you really have to put your heart and soul in and I wasn’t prepared at that stage and then on reflection I’d been to a patchwork shop with, um, Joen Zinni Lask I think her name was in London and seen her quilts. Historic. Old quilts and new quilts and she was a member of The Quilters’ Guild so I joined and I think… I’ve forgotten the date when I joined, er, about 1982. 1982 I think um, with Barbara Chainey and went to, um, one of the AGM in Bishops Stortford which I think was the third AGM so I was a fairly early member of The Quilters’ Guild. And then Barbara started a quilt group down here and I was a founder member of that. And then she got me to teach so I was teaching Hawaiian quilting because I’d done some by that stage. Um, and sash coat quilting which is another technique which I was interested in and sampler quilts. So exploring all the different blocks and how to do them and cathedral window and I don’t know, curved seams I seem to remember doing. So if there was a workshop going I’d go on it and then I’d come back and teach it, you know, as you do. So I don’t know it’s just gone on and on. It’s taken me round the world really. I mean, quilters in Australia and New Zealand and Hawaii. Everywhere… everywhere you go, you know. They see your quilt… oh you’re a quilter when you’re on a ferry somewhere. Well, you know, and you get talking don’t you? You do. And also you’re talking… if you’re working either teaching or going to a workshop you’re talking to other quilters. And so when you’ve got that quilt like I just been to Llandudno and I’ve done fussy… fussy cutting and hand sewing over papers which I love. English…English patchwork over papers. People groan but it’s lovely. It’s a lovely technique. Very precise. And… and we had such fun on that workshop and you learn a bit about the other people who are there and…and then I remember with that bag I remember where I did it and who I was talking to so you’re creating your own history aren’t you? I think that’s what quilting is all about isn’t it? Um, and I’ve just been to France, to Normandy and I met somebody there who’s also… she’s an artist and a textile designer and she got a book there to do with the bees…bees …sorry Gee’s Bend quilts, the Gee’s Bend quilts. It was a huge exhibition of quilts made by women who lives in Gee’s Bend which is an area of the States and they’re slave women. And again the history is wonderful on these… they’re not slaves anymore obviously. But they just make quilts with whatever they’d got. And they’re absolutely wonderful. They’re just mind-blowing modern art. It’s amazing. And their stories too. Well that was… I’d happened to be in Normandy and she’d been to the exhibition. She’d got the catalogue. I’ve taken some pictures of the catalogue. Borrowed the book. Read about it. And so Gee’s Bend quilts if you’re ever… come across them go and see them they’re really, really wonderful. So quilting takes me everywhere. VM: So did you …when you first started doing those first patchwork cushions where did you… did you go to a workshop? Did you just see something somewhere you liked? VM: Where did it come from? PH: I just put bits of fabric that I’d got together. I presume…I’m not a mathematician but I did learn that octagons need squares to tesselate and hexagons tesselate, um, I can’t remember going… I think I was just reading the odd magazine ’cause there weren’t even many books at that stage either. Um, but once I became a member of The Quilters’ Guild, of course, it they have a magazine. I used to read it from cover to cover. I’ve still got the first copy up there. It’s, um just black and white and typing. You know, it’s very simple and it just takes off. And then I met Barbara and the local group. Um, and we were all very enthusiastic and start, um, doing sampler quilts really. And then I taught… teach in Hassle Street in Newcastle I taught quilting and doing a sampler quilt. I was only ever one block ahead of everybody else. Had to work so hard. And there were no computers then. So you had to work out your design and very difficult some of those designs to make them the size that you want from this size. I mean, now you stick it in the printer and you make it whatever it is to get it to the right size. But then it was all complicated. Mathematically complicated which I couldn’t manage very well. VM: Did you buy any books and things? PH: Yes loads of books. Mm. VM: What…what books stick in your mind? PH: Avril Colby and she worked with hexagons and somebody I met, I’d actually been asked to clear her sewing room when she died, and there were bolts and bolts and bolts of fabric all with little holes in because she had cut out that flower and that flower and that leaf and used them. And it’s really back to the sort of fussy cutting as they call it now. It’s cutting out the bit that you want and placing it exactly where you want it to go and of course some of these patterns by the time you put two flowers together and slightly overlap them you get another design …totally different design. But Avril Colby had got bolts and bolts of fabric all with little holes…holes in them. Um, but she was a famous…famous, um, patchworker really. Yes there are loads more books since then. Mm… and I’m giving them away now or giving them to the Guild and getting them to sell them to raise money. PH: That was difficult. Jenny and Alec Hutchinson had a… a… and still have actually a company down in Devon and they were founder members of The Quilters’ Guild and they started this business and they… they had wonderful fabrics. Um, it was…it was difficult. There weren’t… Abakhan funnily enough ’cause they had a…a big warehouse in North Wales and it’s still there, um, and I can remember going in the 1970s over to Abakhan ’cause I did needlework and graphics when I was training to be a teacher, um, and, er, you know, I needed fabric then to…to do mostly patchwork I did for the needlework bit and Abakhan was one of the places we went to. But smaller firms have opened now and done very well but Alec and… and, er, Jenny Hutchinson were one of the first people that I knew. Um, lovely… lovely couple. Mm they used to come to all the AGM’s and things. Don’t see them now. Other people have taken over. VM: Tell me a bit… while we’re mentioning AGM tell me a bit about that first AGM you remember. PH: Well it was just a lunch and it was at Bishops Stortford and Barbara and I drove down there, um, and I entered a piece of work which…which was based on a stripey… a Swiss stripey fabric which I’d bought from Bratt and Dykes in Hanley. The department store which had a very good, um, fabric department. And I’d used these stripes to make the design. I don’t have it anymore. I’ve given it away. And I entered it. It was just a big panel which I’d padded as well. And it came back saying I’m sorry it’s not suitable for our exhibition but the colours are nice. You know how… people are kind… or they try to be kind. So I haven’t entered anything ever again. Not that it’s really put me off but I was a bit disappointed. Um, it was actually cathedral window, sort of folded patchwork, so with stripes it’s interesting because the stripes do funny things but the time you’ve folded them. They make a, you know, a different design which is quite interesting and as we drove down, um, there wasn’t a group in Staffordshire I don’t think at all at that stage. And Barbara and I were discussing it and I said well I think we need a… a representative in Staffordshire don’t we? And she said oh yes. And I said well are you going to do it and she was humming and ha’ing and I said well if you don’t I will. And she said, no I’ll do it… I’ll do it, so she became the first representative I think in North Staffordshire and of course she’d started this group in Stone so that was wonderful. Um, well we must have had a lunch and a lecture but I can’t remember any more about it other than the fact that I was there. And then I went to nearly every one since. Not quite all of them. I’ve got a list…I’ve got a whole list. I got The Quilters’ Guild to give me a list of all the AGM and I can tick off the one…ones I’ve been to. Um, they’ve all… Aviemore was wonderful. Not many people went to Aviemore in Scotland but that was one of the best AGM ever. It was snowy and it was wonderful. It was just a wonderful AGM. Um, and then I couldn’t get home because there weren’t any trains so I had to stop off in Glasgow which gave me a night in a b and b in Glasgow and I was able to go to the museums, the art museum, the next morning and thing. Edinburgh. Cambridge. Southport twice. Scarborough twice. You know, and it’s wonderful that it’s all over the country because you make an effort to go to different bits of the country. I know where the best slot machines, you know, those slotties are in Scarborough the ones with great big old fashioned pennies. Well it’s down the very end of the parade if you want to go to… I don’t like these news ones do you? They’re all flashing lights and things. I can’t manage those. But the old slotties I can manage very well. I went with Cath Sheering to that. Um, I don’t know. Portsmouth. Exeter. Oh everywhere. VM: What do you like about the AGM? PH: I think the companionship and meeting friends that you probably don’t see, um, very often because they live in other parts of the world. Um, it’s always very well organised and you have such fun. I mean, um, in one of the AGM they had an organ which came up from out of the floor, you know, like they do at Blackpool Tower. It wasn’t at Blackpool though. It was another… maybe it would Southport. I can’t remember that. Um, and I mean this… did you go to the dinner? VM: Didn’t do the dinner, no. PH: Well you missed a treat because the talk afterwards from Lynne Edwards was absolutely killing. We were all crying with laughter. She’s the most wonderful after dinner speaker. She really is. I mean, I can tell you the joke but I don’t know whether you want it on here or not. It was about a little… a little girl… again at our age you know your children leave home and then they come back for various reasons and this, um, daughter had said to her parents please can I come home. I’m leaving my husband. Can I come home with my little four year old daughter? Oh all right then. But we’ve got the builders in at the moment. It really isn’t very convenient. Anyway she goes home with this little daughter and she’s living with her parents. Grandpa, to keep the little four year old busy with the builders around, buys her a little tiny wheelbarrow so all week this little girl is helping the builders with one brick in her wheelbarrow and at the end of the week when the builders are given their pay packet this little girl is given an envelope with some money in so grandpa takes her down to the village store on the Saturday morning to spend the money. And the lady behind the counter says oh you’ve got… well how have you managed to get this. Well I’ve been helping the builders. Really? Well how wonderful. Are you going to be helping the builders again next week? She said well if the f—ing bricks arrive yes. And this little tot for this swear word to come out which you can hear the builders can’t you? Well if the f—ing bricks… you’ll have to edit that bit. Anyway it’s Lynne Edward’s joke. And that was just one of many. You really… if you’re ever near her go and hear her speak. She’s hilarious. VM: So back to quilts. So you said your mum wasn’t really interested in sewing at all. PH: No she wasn’t. My granny taught me to thread a needle which, when I see my students trying to thread a needle, makes me absolutely and I keep trying to get them to put the thread tight between your thumb and your finger and to put the needle eye onto the thread which you sort of release into the eye. And you can thread a needle in no time at all. You don’t need good eyesight really to do it. Um, my granny taught me to thread a needle. She didn’t…by that time she didn’t, um, sew. She was a fantastic knitter and she knitted socks for the soldiers in the Second World War. She could turn a heel on a sock. It was absolutely perfect. And she used to write little letters in with the socks which she’d send off. And occasionally she’d get a… a letter back. But she had terrible arthritis too so I don’t think she did much sewing. I don’t remember seeing her sew. She did knit. But she certain… she was the one I can remember teaching me how to thread a needle. Um, no my mother didn’t do any…any sewing at all. No. I can’t sew clothes. I’m hopeless. Useless at putting…I do make bigger pockets in things like trousers or skirts ’cause I like deep pockets in things. Isn’t it a shame that no skirts have got pockets in now. I refuse to buy them. I’m not having a skirt if it hasn’t got a pocket in it. I tell them in Laura Ashley or wherever. If you don’t have…put a pocket in your skirt I’m not buying it. Just tell them. Tell the designers. It’s all cost isn’t it? Economics again. Mm. So I don’t know. What else can I tell you? VM: Can you tell me anything about any of the workshops you’ve been to or quilting courses? You mentioned, um, in your pre interview about lady called Isabel. PH: Isabel Dibden Wright she was in charge of textiles at Manchester University for 20 years or so. She’s just retired. She’s an inspired teacher and she’s a very, very quiet person. Um, incredibly knowledgeable. Does beautiful quilts in her own art and her own right. She took several workshops at Styal museum. Um, I don’t think they do them anymore. But I went to one where she was doing log cabin and one or two other techniques. I can remember the log cabin. And then she had a sabbatical to…to Japan and when she came back she did a workshop on, um, sashiko…well it’s spelt sashiko quilting but it’s I think pronounced sashiko quilting which is just a running stitch usually with white thread on a blue background and it was originally used for, um, making clothes very strong. Having several layers of clothes like the firemen or fire fighters in Japan in the past had very, very thick cotton garments so that they could stand the heat of going into fires. And they also use lots of old, um, kimono… beautiful, beautiful fabrics and if they’re wearing they will still use them. Either put them in… in layers, um, but nothing is wasted. The Japanese love, even… people will have just… just packets of beautiful fabrics and get them out just for the joy of looking at the fabric. Um, anyway sashiko is really work, work wear and there are all sorts of traditional designs like… well this is five sided but, which obviously tesselate with long diamonds. But they have waves and, again, a bit like the Hawaiian. It has a long, long tradition in its own right. Um, beautiful… beautiful sewing. Absolutely exquisite. So that was what… I went to two. And through that I got to know Isabel. I don’t see her very often but she’s a good friend. Um, and of course now she’s retired she took up a position with the British Quilt Study Group, um, on encouraging people to do papers. She’s been running courses on, um, helping people to research quilts. Um, and, um, and then how to put a paper together which she was very helpful with me, um, but then hands me onto the other…the editors and things to do it which is not really my scene. Anyway, um, I’ve done it. VM: So when you ’cause you tried… like you say with the Hawaiian quilting and sashiko you’ve stuck to quite… how they would do it traditionally. So like you said with the Hawaiian you stuck to two colours because that’s what they would do and the sashiko you’ve… you’ve put white stitching on a blue background, so do you tend to do that and stay with how they would traditionally do it or do you play with it a bit? PH: I think I certainly start with that. I was interested when I was teaching sashiko quilting and produced all the traditional designs for them and some of the students went way out which was really interesting. They took a picture or a…or, um, went round a flower or something and did quite different things with their sashiko and I was really interested in that. In fact, I have explored it myself ’cause I’ve got a couple of little quilts upstairs where I love rhododendrons and go to the Dorothy Clive Garden for instance in… about now… very soon. May isn’t it? June. For the, um, the quarry garden at the back. And magnolias are another thing which really interest me so I’ve drawn a magnolia and I’ve actually quilted round it and made it into a quilt. And now that is white on white actually which is quite effective sometimes. White on white. Um, with designing. So I have explored from… from the basis but not a… not a lot. I don’t think I’m very inventive, you know. I think I need somebody else to… like Betsy to spark me onto these leaves and just show me really the next step. I have the ideas but I often can’t do the leap from that to interpreting the design. Um, but I find…I find that the most difficult bit I think really. But I was interested in my students don’t they obviously… good for them. Perhaps I, you know, inspired them somewhere along the line. VM: When you… ’cause looking through some of the quilts you’ve got you’ve some bed quilts, you’ve got some cushions but you’ve got some that have obviously been done just so you could explore an idea. What… what sort of things… how do you decide what you’re gonna do next as your next project? PH: Well I have to say I really like things which are practical. I’m not very keen… I’ve got one or two samplers up there which I don’t know what to do with. Um, I mean, this piece of sashiko is a furoshiki and so I use it. It’s a carrying cloth and I put… when I went to the AGM I put my stuff for my workshop in it and tie it. It’s a carrying cloth. Um, and of course the quilt is a bed quilt. Um, cushions. Well I’ve got one or two cushions around. I don’t want to fill my house though with patchwork. I don’t… that’s not what I want to do really. Um, bags. I’m… I make bags, um, which I’ve made lots of bags of various sorts. Book covers. I often make a book cover. Um, and I’ve done that. I’ve made boxes as well with little tiny bits of patchwork on the top. But I give them away, you know, I can’t use them all really. Um, I don’t… I don’t really feel that I want to make things which I want to put on the wall. Having said that that… that, um, where the wild things are… mind you it is a quilt. It could be put on a bed. It would be awkward to have it on a bed ’cause it’s got so many 3D bits. It’s almost like stump work isn’t it really? Um, it probably needs to stay on a wall rather than going on a bed. But it could go on a bed if necessary. Mm. the other thing I have made is floor quilts for my grandchildren and those have been… well the first one I made I di which was really a circus so I did a clown who was juggling balls and put him on a curved with quite a bit of sashiko or running stitch quilting. Again, to make the lines of the sand for where the clown was standing. And the next one I did for my grandson was kites and that was based on a figure that I’d seen in a book, a children’s book where there was a little boy flying a kite. As I did the outline of the little boy and the kite flying and then I turned it over and thought I’d make it double sided and put the border on, realised I hadn’t cut enough fabric had I and so when I got to the corners there wasn’t enough. So I then had to make four kites to fill in… fill in the corners, as you do, and made the tail… the tails of the kite sort of meet together in the middle. So that was… and the next one was to do with a children’s… a third grandchild, was to do with a children’s story which is ‘I can draw a star’. Um, so I did… more or less the illustrations from the book. The little house and the… and… and plants and things and then I turned it over and I did it… the back… the very back of the book was at night-time with stars so it was a double sided quilt again and I… I did the sort of navy blue background and I drew the star or I quilted the star on the back. Another quilt I did with a friend with… from Butterton was, um, again The Quilters’ Guild suggested that people made house quilts to sell. Well, you know, there’s a traditional little house with a door and two windows, um, and then people would then sell them to raise money for The Quilters’ Guild. Well we decided we’d do lighthouses so my friend Dorothy was a particularly neat sewer. She taught sewing. So we did about, um, eight squares with lighthouses in them and some had got flowers round the base of them or vegetables or whatever and we put these together and then we needed to make it a different shape. So, again, I used sashiko quilting and we had a dark navy blue background and we sash… with a white thread. Just did the outline of the lighthouse with the lights coming out and the bottom we did a… a… a… a border with waves, again in sashiko quilting, and then we couldn’t decide how to put a border round it but we got some stripey fabric which we put round but not completely all the way round. We did a different colour so it asymmetrical. The whole thing was asymmetrical and we gave that away to be raffled. I wish we hadn’t done it. I’ve got the pictures still. It was a super quilt. I wish I’d kept that one. That’s one… I don’t mind giving things away but I wish we’d kept that one really. So presumably it made money for The Quilters’ Guild. Where it is now I don’t know. I don’t know who won it. I wish I… I’d buy it back almost I think, if I could find it. But that, again, you see it was different techniques being bought together in the one quilt and Dorothy happened to be a super embroiderer. And then we did the project in Butterton which was part of a bigger project. You know, the WAVES. Women Achieving a Voice in Stoke-on-Trent. Er, there was an advertisement in the Sentinel. Saying people… groups of people who would sew would they like to come together and produce a block. Um, so all sorts of people like the handicapped school in… in Stoke-on-Trent. They got together and did a block. And other people. And in Butterton I decided to ask the ladies if they’d like to contribute to this and 17 of them said yes they would. And so we used to meet and we only met for six weeks and in that six weeks we went out and we had a lovely trip out to a nice shop which is no longer there in … in Longmore. Um, and visited the pub for lunch, of course, and came back and we put the…the foundation fabric and then each person chose what they would like to do and it was something to do with Butterton. So somebody chose the Victorian post box and did that. And somebody else did Rusty, the horse, who lived next door to me. And somebody else did the… the watercourse which is in the middle of the village and another lady who’s a wonderful, wonderful sewer who’s since died she did the church. And I’d learnt, at another workshop, to machine so that you… I can’t remember quite how you do it. I think you push the feed dogs out and machine so all the machine… you know when your machine goes wrong and you have all those loops underneath and you curse well you can do that deliberately. And you do it in a frame and you stretch nylon tights over this frame until they’re really, really tight and then you’ve done that mistake deliberately and you turn it round the other way and you release it from the frame so it all [claps hands] collapses and comes together and you’ve got a very nice tree. So I did the trees ’cause I’d learnt how to do this round the church in Butterton. Um, and then we plied it all and we put it all together. And the framework of the… of our block were the roads. So we’ve got the M6, the A53 and the B whatever it is and it makes a rather interesting shape so all our Butterton village came together in the middle of the shape. And we had such fun doing it. And we did it all in six weeks. And then we had a party, a sloe gin party, and invited the husbands to come as well. So that was great. It’s hanging in the church now. And there’s a book to go with it to tell you who did it, you know, which is nice. I like village …village community things. I hope we’re going to have a party to celebrate the Queen’s 90th birthday. But I … I don’t live there anymore so I don’t have any clout. I have put out a feeler. So I’m hoping… I think we should have a street party. Are you having a street party in your street? VM: No as far as I know. PH: Perhaps you should say something. VM: I’ll sort it out. VM: You’ve mentioned some of these projects you’ve worked on. You’ve not mentioned much about Linus. You do quite a bit with Linus don’t you? PH: I do now. Again, because I’m 81 and I’ve got a stash of fabric upstairs and I’ve helped to empty, er, a good friend of mine, who died four years ago, her husband asked me to help empty her, um, sewing room which I’ve done but she was more of a felter than… than… anyway I helped him and I just thought I’ve got three sons and… and daughters-in-law, one of whom is really interested in textiles but what would they do with it all. I can use it up now. So I’ve been going through my drawers and I have… I know I’ve made 60 quilts. I’ve probably made 70. Um, over… particularly since my husband died. It really helps me feel I’m doing something for somebody else but it also is a very peaceful occupation to do in the evenings. Um, it keeps me awake so that when I do go to bed I’m tired otherwise I nod off in front of the television like we all do but if I’m sewing I don’t and I think oh I’ll just do one more block or I;ll just do one more…ooh yeah and I’ve nearly finished this and then the next morning I’m down on my knees on the floor upstairs on the carpet because I can, um, put the three layers for a quilt together best on a carpeted floor ’cause you can push your needle right through and you know you’ve gone right through and you can pick it up again without catching what’s underneath. I find a carpet the best… the best thing to work on. And so yes and Linus… Heather, um, I can’t think of her surname who now lives in Bridgnorth she’s our local collector and she comes to the Stone quilters and she takes them away and she signs… and she sews in the little Linus… they have a Linus, um, label in them and then she gives them to hospitals to er, children’s special needs, to, um, people who’ve been fostered. They used to be, um, pushed out into the world really at the age of 16. Now that’s altered and I’m not sure whether it’s 18 or even 21 now. Um, those people who’ve been fostered if they don’t actually stay with the foster which often they can’t, um, they’ve got nothing really. So she… she’s quite keen to have some of the bigger quilts really. Um, and boys quilts I think are… are, um, in short… short supply. There is another, um, offshoot… well it is Linus still where babies are very, very restless or children are very, very restless they make weighed quilts for Linus and I’ve looked at those and they have these special pockets inside them where they put weights in and it helps to calm a child which, um, I thought was an interesting, er, well something I didn’t know about really. Er, I haven’t made any of those so I just make Linus any… any… and it’s very free because I think well I’ve got this fabric what am I going to do with it. Go with that and shall I put a teddy bear on it or a …or an elephant on it or a car on it or… just… I just do what I feel I want to do. And it’s liberating really. I don’t have to …it’s always got to be constructed well, always, and quilted and… and it’s got to be able to be washed. Er, so the construction I always make sure that it… that it’s good but I just feel free. Can do anything I want to do with… with the fabric that I’ve got. And it’s interesting to see… some fabrics which you thought you’d never use up, you know, you do use them up. Even little bits. I’ve had hundreds of little rectangles which I didn’t know what I’d ever…what project they were for and I’ve made all those into a quilt which is one of the quilts I took to Llandudno with me. So it’s very… very free. You carry on. Make a Linus quilt. Give it to me and I’ll give it to Heather. She’ll be thrilled to bits to have it. VM: When…when you say doing the Linus ones, you know, you can do whatever you want has anybody ever asked you to make them a quilt? VM: All different aren’t they bless them? PH: Well everybody’s different, yes, aren’t they? Yes. So I must admit I love the out… the outline of, um, zingy. You know, EDF electricity has a little orangey chap with big round eyes. I’m sure you’ve seen the advertisement. PH: Well I think he’s gorgeous but I don’t think I want to advertise EDF electricity even though he’s my supplier. But I think some of those, um, little images are wonderful, aren’t they? They’re…they, er, capture your imagination. Mm. VM: With talking about children and inspiring them tell me a little bit about some of your story quilts that you’ve made. PH: Um, well it started with…well I suppose with my own grandchildren. I didn’t think about it with the first one. I just thought what shall I do and a clown at a circus seemed to be the answer. And then the kites. Well I had seen this, um, image of a little boy running and it probably by one of the children’s authors. I can’t remember now. It was just a line drawing and I just thought I can do that in stitch. And it was a lovely free…free, um, free …the whole picture was just free with the child running and the kite and the wind and things and that’s what got me interested and I got the book and did the outline and then I thought kites. Well kites they’re fun aren’t they? I do, I love …I go up to the Roaches and fly kites. I used to do it with the children every… every year without fail we’d go up to the roaches and fly kites and I’ve still got the kites and after my husband died my children from Australia were here for two weeks. They managed to stay with me for two weeks until after the funeral and, um, just before the ashes were scattered which we also managed to do before they went back they said I think it’s time we had a day out and I said oh well what shall we do and they…they suggested that we went to the Roaches. Mark had remembered and I don’t know whether the other boys… it was just Mark and maybe Andrew. I don’t think all three boys were there. But the…we went out anyway and I found the kites. They’re still here. I got the kites out and we went and we flew kites on the Roaches and in remembrance of Philip which is a bit sad. Um, anyway we still do it. So that was the next one. And then the one after that was this star which I thought was a nice story. And then the …I have step-grandchildren in Australia who in turn have children. Um, and so I got this Victoria’s pocket book. I can’t remember who it’s by. Is it Victoria’s Secret Pocket or can’t remember the actual title. Anyway it’s about this kangaroo and, um, called Victoria. Victoria has got a baby in her pocket but she puts other things in her pocket like spoons and forks and knives and cactus plants and things and a fish in a goldfish bowl with water and the baby gets fed up so he jumps out an goes to stay with Mrs Koala and then ducks ad all sorts of people and …and decides none of them is any good so he’ll go back to his mummy but of course by that time his mummy has got another baby in the pocket so he can’t… he can’t go back home. Um, and that just inspired me. So I then went to… I think it was Uttoxeter and there was somebody there who… I know the store very well and they have quite a lot of African fabrics and I said I need a background for Australian outback and of course they’d got it hadn’t they? So I bought the fabric for the [clears throat] outline and it was the same template that I’d used for Butterton. The Butterton, um, sewing has got a pale yellowy centre and then a darker green outline and I used the same sort of technique with the [clears throat] um, Victoria’s pocket where the centre was a yellowy colour and then the outback was all a darker, um, sort of pebbly background. A bit like that bit in my garden really at the back there. Um, and then I put all the characters round it. Um, and so yes I’ve done the wild things. Where the wild things are is my most favourite children’s story. It’s wonderful. So that’s upstairs and that’s for me. Er, so I shall d another one. Yes, I think that’ll be my next project really is another story quilt of some sort. VM: Are you the sort of person who gets a quilt in your head and then goes out and finds the bits and makes it and finishes it or do you have various projects on the go at once? Do you have some unfinished ones? PH: Um, yes I always have several on the go [clears throat] but once [clears throat] once I get enthusiastic about things I do get going on it but I’ll do a Linus quilt In between. Um, while I’m thinking really. Like the …where the wild things are I went up to Abakhan in Hanley and got the sort of leathery type or furry type which was a story in itself ’cause you know Abakhan they have a stack of furry stuff in one corner [clears throat] and I chose six and they are huge round bolts. Quite light to carry. But they are huge. And I lined up these six enormous bolts of fabric by the cutting thing and said ‘how… what’s the minimum I can have’ and she said ‘oh ten centimetres’ so she was cutting ten centimetres of furry fabric. [Clears throat] I only need, you know, two centimetres but she cut me ten centimetres off all these fabrics and I brought them home and I’ve given most of them away now ’cause I only needed a little bit. Um, and then I’m sort of thinking well how am I going to construct that monster. Um, so while I’m thinking about it I’m making a… a Linus quilt ’cause I can just put them together quite quickly and then I go back to where the wild things are. It took quite a long time to make that simply because I got other things on or I was doing this paper for British Quilt Study Group or I didn’t have a lot of time so it probably took me six or nine months. But if I really get going on it I’ll do them within a week or fortnight or something. It depends on… on what it is really. But you need thinking time, you know. And you need to sometimes you need to put something up on the wall and just keep walking past it and then you’ve … oh yes well that’s not right there, you know. That colour’s got to be in a different place. A lot…a lot of doing these things you need thinking time really which I hadn’t realised to begin with but I know now. Don’t hurry it. If you …if you really don’t know how to make the decision leave it for a bit… leave it for a bit or ask somebody to come in which I’ve done before. Asked a friend to come in and ‘what do you think of this?’ Well, you know, and that’s what happened with the lighthouse quilt. We could not work out the border and Cath Sheering happened to come in. She said ‘well why can’t you have it asymmetrical?’ Er, I think we hadn’t got enough fabric. I think that was the trouble. We wanted this grey stripey fabric and we hadn’t got enough of it and she said well have it asymmetrical. You know, why didn’t I think of that before? You just need somebody else to… to say it don’t you really. Um, and this is where Isabel Dibden Wright is so… she, she sort of nudges you so that you… she doesn’t tell you what to do but she would sort of nudge you, you know, so here she… it’s asymmetrical isn’t it? Which I love. Um, and I used it as the border as well. You know, I just turned it over and I don’t know a skill… she’s a skilled teacher. You always remember the really good teachers don’t you? Mm. And she’s one of them. [Microphone noise] definitely. VM: Where do you sew? I mean, you said that you sit and do hand sewing in front of the tele but where in the house do you keep your stash? Where… where do you do most of your work? PH: Well that’s… that’s in … I suppose you’d …the estate agents would call it a fourth bedroom if we were selling but it isn’t really a bedroom. Well it has a bed in it. Um, it’s the smallest room and it’s not very comfortable. But the other rooms [clears throat] upstairs are spare room. You know, I can’t… I couldn’t possibly start to move all my stuff [clears throat] when visitors come to stay or the children come to stay so that small room is stacked with everything I need and I can leave the ironing board out all the time and leave the sewing machine out all the time. I’ve got music up there. Radio 4. All my books. Everything is to hand if I can find it. Um, but then I work up there mostly perhaps during the day and then I get my hand projects together so that I come down in the evening and by the time I’ve had my supper perhaps half past seven or something the hand sewing is there ready for me to do. I don’t have to make any more decisions. I can just… repetitive sewing which is the… the really calming effect and lovely, lovely peaceful thing to be doing all the time. But all the decision making is happened at some… some other time which is why Linus quilts are so good really because, um, I’ve decided what I’m doing and… and then I just come down and hand sew them or I would… this, you know, I just sat for hours with it spread out all around me. It… it was beginning to fray badly by the time I started to do the needle turning on this so it was not an easy job. Um, because I’d left it too long hadn’t I? Naughty girl. VM: Do you have many things that go ’cause I mean, you said that this… this got ignored for… a few years. PH: It did get ignored. Have I got many ignored… um, I certainly haven’t got any pressing… no I haven’t really. I mean, the quilt that I donated that was there in the roof for a long time and I knew something had got to be done about it and Philip kept asking me ‘when are you going to, you know, get that quilt?’ I got a whole lot of silk fabric to insert where it had gone which I understand now would have been the wrong thing to do, so it’s a good thing that I didn’t do it because they have conserved it beautifully with net over the, um, the… the frayed, um, taffeta and satin and stuff. Er, but it was there. It was nagging me ’cause I knew he wanted me to finish it, but actually it wasn’t in a state where I could have put it on a bed. It was too… getting too fragile. And likewise I wouldn’t have wanted to hang it ’cause it was quite heavy and it would have needed hanging possibly with two rods to help take the weight or displayed as they displayed it at The Quilters’ Guild museum which was on a raised dais. It… they… they displayed it beautifully for me. Um, so that was one nagging and that was the other big nag there at the back of my mind that I really should do… no I don’t think there’s… I don’t know there are bits upstairs which I might incorporate into a quilt. If you’ve been to, um, a workshop and you’ve done a… a sample and you’ve actually finished…finished the sample. I did put them all together in a quilt. Dotted them all over and put blocks in between and finished it. I don’t know what I’ve done with that. I haven’t got it anymore. There is one thing which I haven’t finished and that is the Quaker quilt in … Quaker hangings which are in Kendal. I don’t know if you know anything about the Quaker hangings. Well the Quakers, who’s, um, headquarters are in Kendal they have done… I think they call them the Quaker tapestries and they are about this big. Like that. and it’s a little bit like the Bayeux tapestry, um, and they’re blocks and they’re all religious subjects ’cause the Quakers, um, and they’ve put them together and well worth seeing if you ever have the opportunity. They’re put on big boards… big boards so they tell the stories, the Bible stories, and it’s lovely sort of wool. Specially woven woollen fabric background. And wools which again, the colours are all specially dyed for them, and I did go on a workshop there. And I chose a block which was to do with gardening and flowers and not far into this project I chose the wrong colour of something. Well it’s just, you know, that is sitting in a drawer. Whether I shall ever finish that or not I don’t know. I feel cross with myself if I don’t finish something off. I did a… I went to Caldon College to embroidery class when I first married. This is about 1959, 60, 61. Wonderful teacher there too who’s died since unfortunately. Um, and she had bits of patchwork which she gave to me which was interesting. Um, I can’t… anyway I worked with her quite a lot. We… I did try and make clothes which didn’t work at all. But there I started, um, and a friend who’s an artist and a designer for Doulton’s actually, very good friend. I said I want to do a dragon to do the seat of a chair, which is there and she helped me draw a dragon and we worked it all out on graph paper and I did the dragon with all sorts of different stitches on canvas. So it’s canvas work really. And he was lovely. I’ve still got him somewhere upstairs. But I haven’t done the background and I’d started on the background with a stitch which was too big for the canvas so the canvas was being… the further out it got the less space there was for my background stitch. And I… so I gave up again. Well I have finished that but I’ve used a different easier stitch but it’s now so wobbly I don’t know whether it’ll ever sit on a chair. I have finished it but it hasn’t come to fruition on a chair yet. Whether it ever will. Otherwise, no, I think… I think… so it’s Kendal maybe you being here is just going to get me to finish that Kendal one. And maybe get the dragon put on a chair. I don’t know if they can stretch it. In between I’ve done rag rugs and all sorts of things. I got some rag. That’s from the museum in Hanley. [Pause and movement] Do you recognise it? VM: What … why …why do you do quilting? Why do you enjoy quilting? What keeps you going at it? PH: I find that an incredibly difficult question to answer. I think it’s just… I don’t… I really don’t know. I mean, why do people climb mountains and leave their children behind or sail or… or, you know, do horrendous things like they do or run marathons. It’s… I think it’s just something within you and it possibly answers a sort of spiritual need as well. Um, I don’t go to church anymore. Um, and I don’t know that I really believe in God. I mean, maybe there is something out there which has produced the universe but the more you see of science and… and… and… I just don’t know that there is anybody there. But it doesn’t stop you having this inner feeling and response to things. Nature particularly. Um, you know, landscapes or even looking at the stars or or… I think we all, as humans, have a response to…to that and some people will dance because just for the freedom of being outside or in the open air or… I mean, I love swimming in the sea. The actual feeling of swimming in the sea is just wonderful. I think it’s just comes from within you and the mountaineers go mountain climbing and the… I don’t know the people who fly love to be in the air don’t they or, um, and people just create quilts ’cause they can’t help but… but somehow express themselves in… in the use of colour or the… and painters do the same, you know, they have to sort of record but they put down what…how they see a flower, you know. The flower is there but they don’t copy it absolutely. They do it a different colour or they make its shape different. It’s their response I suppose to the… it is their response to the world around them isn’t it? So I don’t know. I just feel I have to do it. The day when I really can’t sew I don’t know what I’m going to do. Er, well I hope I’ll be able to sew somehow or other. Mm does that answer your question? VM: That does answer my question thank you. So anything that you find frustrating when you do quilt making? PH: When I’m doing quilt making? VM: Or anything about the process. VM: About the process of making a quilt. PH: Um, well there are certain techniques which I feel I can’t do ’cause I can’t manipulate fabric as I used to. And my stitches aren’t as small as they used t so I find that a bit frustrating. That I physically can’t do anything. But when I make mistakes like doing the kite quilt I find those sort of things a challenge rather than… I think oh blow it I haven’t cut out enough material and I haven’t got any more but those problems I find a challenge and fascinating and you overcome them in some way and that I… I like that and I feel very satisfied when I’ve done it. But otherwise frustrating. I don’t… I don’t think so. No. VM: You talked a little bit about when you first joined the guild and then about, um, the Stone Patchwork and Quilters, well Staffordshire Patchwork and Quilters. Can you tell me a little bit about that group and about when it…when you joined up and what it was like and what sort of things you’ve done with them? VM: So you’re still a member of the Staffordshire Patchwork and Quilters? PH: Yes, we’re not actually members. There is no membership. You just pay on the door which Barbara started right at the beginning and she would get people to perhaps take on the treasurership and a secretary or speakers, um, and a chairman. So we still do have… it’s… t’s… it’s… it’s formal in the sense that we do have those officers. But you’re not a member so you’re not committed. I think it’s quite an interesting format really because people felt they could come and go as they wanted to rather than having to sign on, pay a subscription. Um, it’s… it’s… it’s good. It has a lot of people. Come… come one evening. You’d be very welcome. PH: Four pounds on the door but… but… and yes and there are always merchants there. They always have somebody there selling fabric so mm… and good speakers. VM: When you go to places like Festival of Quilts, um, obviously with the AGM you go and do your… to your different workshops and things, what sort of things do you get out of things like Festival of Quilts. Do you go for exhibitions, workshops? PH: Well actually the Festival of Quilts now is so overwhelming. I used to go to Malvern when they had, um, quilts there which was about right for a day’s trip and, yes, I store up. At the moment I want some applique pins and I can’t buy them locally so I shall wait to go to the Festival of Quilts and buy them. I find the Festival of Quilts now in Birmingham is so enormous. I don’t want to stay overnight and I don’t really want to go to workshops anymore because I know more or less what I want to do. I did want to go to a workshop at, um, Llandudno to do this cyanotype technique which I’d not done before but other than… unless it’s something which I really haven’t done before and would like to do, um, I … I don’t bother with workshops. And actually that… you see I don’t bother with the gala dinner and the speakers there, which I’m probably missing out but then I go to the AGM and I enjoy that so much more. It’s a smaller. There are 410 people at Llandudno apparently, um, that’s a group of people that I’ve sort of met over the years. Whereas the Festival of Quilts is…is wonderful and I wouldn’t not go. I always go for a day and I love seeing the quilts and I meet people there and it’s a lovely day out. But I’m exhausted at the end, particularly when I’m buying a huge roll of batting and trying to carry it home. Um, so I shall go again. I don’t know which day I shall go. I leave it until the very last minute and then just walk down to the station and hop on the train and go. And I got to Uttoxeter as well which, um, there weren’t as many… did you go to Uttoxeter? There weren’t as many quilts there this year. There were a lot…lot more merchants I think. None of whom had got applique pins. Um, but I did… I met somebody there, um, and had a long talk to her about another technique which is actually layering flowers… petals of flowers in between and, um, and then quilting over it and that… that’s something that I shall follow up. It’s… she’s… this particular lady has got a workshop on a day I can’t go and she hasn’t got another workshop this year on it. But that’s something… you see I suppose it’s a technique which is leading me by the nose to wherever I… I want to go. And then it might be something I want to do. Might be… might not. The Embroiderers Guild which I’m a member of, you see they’ve got a chairman’s challenge on this year and I haven’t set out on that yet. They want you to do a piece about A5 and the subjects… they’re releasing them over each month. The first one I think was flowers and the second one was fruits and… and seeds and the next one was fungi. Mushrooms. And the next one was birds and there are two more to go. And at the end of it, you don’t have to do all six, you can just do one or two but you have to produce something at the end where they’re all brought together. So if I did do all six I should have to think of something …and you see this is where it’s got to be practical. For me it has to be practical. It’s not going to just go on a wall so it’ll have to be part of a quilt and then I shall have to put borders round it or it’ll have to be a cushion cover but it’ll have to be in colours which fit into my sitting room. I don’t know. A book cover. Well it would be a rather big book wouldn’t it? So I don’t think that will work. So it’s still going round and round in my head. But I thought the cyanotype technique might work quite well because I could put fruits and seeds in, um, I understand the cyanotype technique is a specially treated fabric and then you lay on flowers or ferns or…or shapes or something and you put it out in the sunshine and the sun… and then you pick the leaves off and there’s the shape underneath and it’s usually blue and white. It used to be used for plans. For huge plans for buildings and things this cyanotype technique. I thought that would work but you see I don’t know the technique well enough now so I’m stymied. I might not get that done. VM: Can you Google it? There’ll be a YouTube video somewhere. PH: Well there probably is. Mm… anyway I haven’t got very long. I’m going away next week and might not get done. But I feel if you’re a member of these groups and they throw out a challenge then you should take part. I mean, I would never win but I… that’s not part of it. It’s just taking part because you want the winner to have had lots of other people to win, you know, against don’t you? So I feel I should take part. We’ll see… we’ll see. Might get that done. That’s a good group. Really, really good embroiderers group. Started, oh 25 years ago but again it’s, um, you know, 60 or 70 people. A big membership. And they all turn up. Mm really, really good. In Audlem. VM: Right my final question I’ve got is what do you think is the biggest challenge you face as a quiltmaker? VM: What’s the biggest challenge you face as a quiltmaker? PH: Gosh… [Long pause] I don’t really know how to answer that. Whether it’s a challenge… the actual physical doing of it or… I suppose the designs. I still find the designing difficult. Um, which is perhaps why I find the Linus quilts quite free is that I don’t have to worry too much about the design. Um, possibly the designing and sadly the physical aspect is going to be a challenge for me. Um, if you say to other people, um, they’ll say what do you do and I say I’m a quilter they don’t understand and you have to say patchwork and quilter. Now they understand patchwork but it’s… the patchwork bit gets slightly denigrated because of course some patchwork is just really bits thrown together without much thought whereas think some of the historical patchwork is wonderful because they have been… if you look at them there’s been a huge amount of thought put into the placing of certain colours against other colours and I think there’s been a… some years ago patchwork was literally just thrown together pieces were not aesthetically pleasing. Um, so I’m reluctant to use the word patchwork if people ask me what I do so I say I’m a quilter, um, and actually of course I use quite a lot of applique rather than…than patchwork. Sometimes getting…getting that over well, you know, there’s a lot to quilting historically. Social history isn’t it? Huge, huge social history which mostly women did. Again, have you read the book called the Last Runaway by Tracy Chevalier? Well that’s to do with slaves in American just be… well slaves, some of them were begun…were free but they were still running away from the south and getting to the north, um, and in that book quite a lot of quilting comes into it because the women were at home and sometimes they might… it isn’t really the main story of the book but sometimes they would perhaps put a quilt on a washing line which was an indication that …that food and water would be available in the barn or if the slaves was…and they would be moving them onto other people. And Tracy Chevalier has become interested in quilting and now quilts having written that book. And she put together an exhibition in Danson House which is sort of in… in Kent, um, which was very, very interesting. She got modern quilters Michelle Walker and other people to … to make quilts. Very small exhibition. She used one from the V & A [Victoria and Albert Museum) and she used modern quilts as well. And then she… at that, um, exhibition there was an ex prisoner who had been in prison in the States for 17 years so it must have been a fairly serious thing but was brought back to Britain to finish his sentence but while he was in the States he’d learnt to machine quilt. You know, it was part of the work programme. And he became very skilled at it. And when he came back to Britain he continued to…to sew and there’s this charity called Fine Cell Work which is an amazing charity. Quilters go into the prisons and teach men and women how to sew. And they make beautiful quilts. And they’re commissioned by famous people to make quilts. And he was there giving a workshop, er, or a talk really not a workshop. A talk on his work and some Fine Cell work and the quilt that he had taken part in and I think there were 40 or 50 prisoners and they’d all done a block and they were put together and the quilt was there. I’ve seen it again in York when Tracy Chevalier gave a talk. You know, quilting. And there was a wonderful exhibition at the V & A about six or seven years ago where there was a Fine Cell Work quilt and they’ve done another one since. Um, you know, it’s… it’s… working with your hands isn’t it? And apparently the prisoners are much calmer if they’re…if they’re sewing in their cells and also they earn money by it so they’ve got some money by the time they come out, and a skill, as well as helping to pass the time while they’re incarcerated in prisons. I just think sewing, when you think back to the history of the slave trades and the Gees Bend… I must get that the right way round, Gees Bend Quilts. Gees Bend is a river and that’s where they all lived. Um, I think it’s a… it’s a wonderful social history. Really that’s… that… that’s what it’s all about isn’t it? So you better carry it on then. [VM: I’ll do my best] I shall look forward to this quilt. I’m a good nagger you know. I’m a great nagger. I won’t let you go. I’ve got your email. VM: Well thank you very much. Is there anything else you think of you’d like to say that you think we’ve not covered? PH: I think we should stop. How are you going to transcribe all that I don’t know.